Greetings! 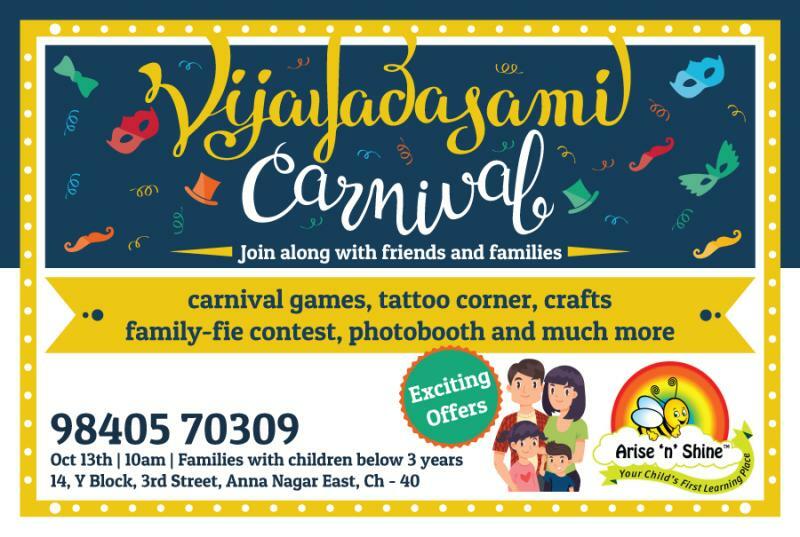 Get ready for some fun with friends and families at the biggest celebration of the season; Vijayadasami Carnival hosted by Arise ‘n’ Shine Anna Nagar East. Come join in to be part of some exciting events and don’t miss your chance at getting some exciting offers. Venue: Arise ‘n’ Shine Anna Nagar East – 14, Y Block, 3rd Street, Anna Nagar East, 600 040. This event is meant for families with children below 3 years. Call us for FREE REGISTRATION!